It is no secret that most GCC countries have been focusing in the recent years on developing urban futuristic communities. The mega projects serve not only as a means for its growing population to escape the confines of its limited land area, but also as world-class business and tourism attractions as well. Due to its nature as an island kingdom with a small area, the Kingdom of Bahrain has been paying more attention to developing artificial islands. These projects have stood out due to their potential and the impressive developments that are currently being developed there; and Durrat Al Bahrain comes as one of the finest of these developments. 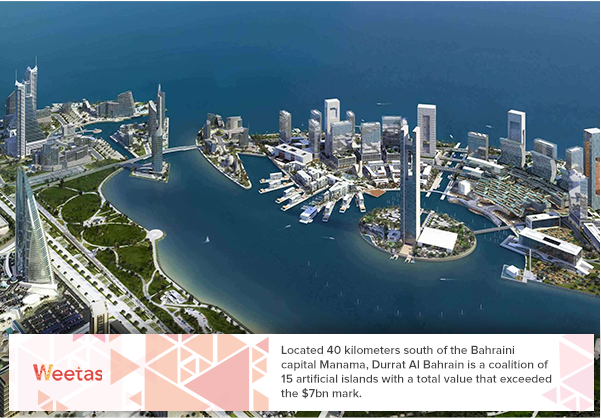 Located 40 kilometers south of the Bahraini capital Manama, Durrat Al Bahrain is a coalition of 15 artificial islands with a total value that exceeded the $7bn mark. Spanning over 21 square kilometers, the reclaimed lands were designed so that they would have a spectacular distinctive aerial view. The coalition is considered to be the second largest artificial island in the Kingdom of Bahrain. Six of the 15 islands, known as Murjan Islands, are shaped like atolls; five are shaped like fish (Fayrouz Islands); one is shaped like a crescent; and the last three are Durrat Marina. The islands are planned to accommodate up to 60,000 residents plus 5,000 visitors daily upon their completion. Durrat Al Bahrain is connected to the main island via two causeways. 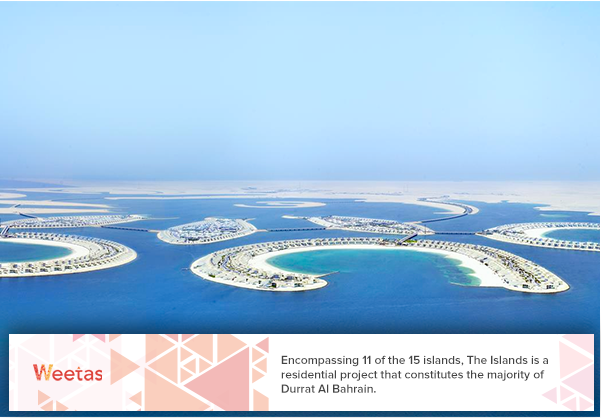 Encompassing 11 of the 15 islands, The Islands is a residential project that constitutes the majority of Durrat Al Bahrain. The project comprises 1,000 upscale villas with different models and specifications designed to meet all the possible homebuyers’ needs. The Islands is a sustainable and self-sufficient project as it houses all the facilities and amenities the residents might need. Each of the 11 residential islands of Durrat Al Bahrain has a single-storey community center to serve the daily needs of its residents and visitors. In addition to that, Durrat Al Bahrain islands have multiple other facilities and luxurious amenities including mosques, gyms, health clubs, indoor fun areas, as well as a number of world-renowned brands’ outlets, restaurants and cafes. Also, vast areas of the islands are meant to be greenspaces that help balance and complement the landscape. 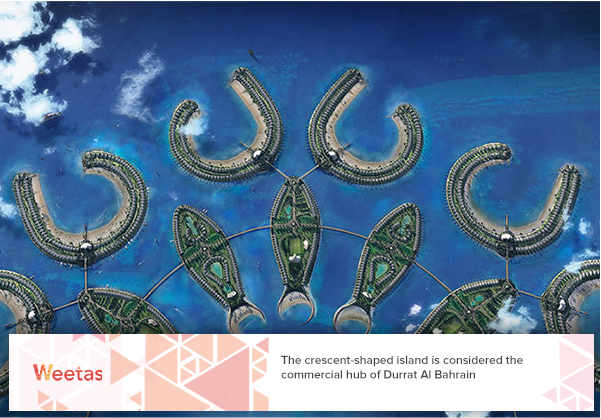 The crescent-shaped island is considered the commercial hub of Durrat Al Bahrain; it houses more than 6,000 offices and residential apartments overlooking a lively courtyard that includes multiple world-class restaurants and cafes. The crescent island will feature public beaches along its coastline, as well as a number of vital facilities like healthcare centers and schools. The island is also connected to the hotel island which encompasses 6,000 luxurious hotel rooms and its own private beach. 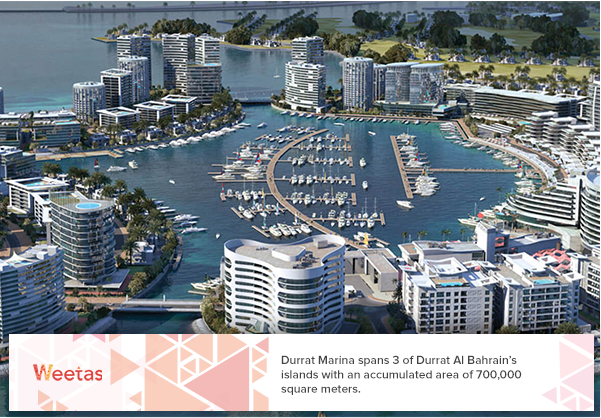 Durrat Marina spans 3 of Durrat Al Bahrain’s islands with an accumulated area of 700,000 square meters. 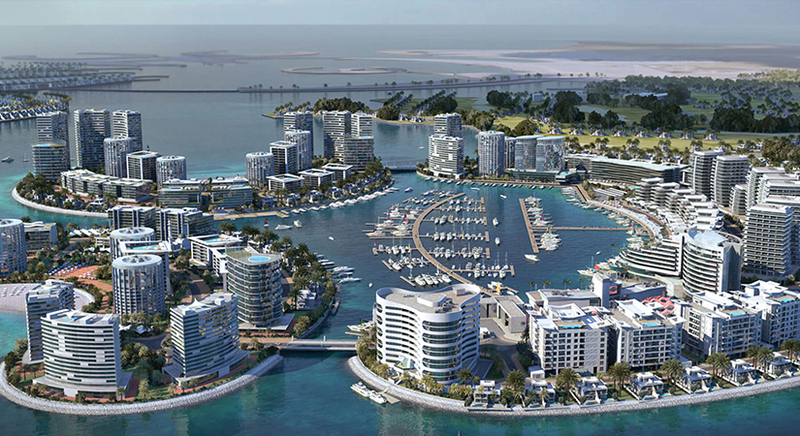 The marina is a joint venture between Taameer, one of the region’s leading developers, and Durrat Khaleej Al Bahrain; it is considered the first development of its type in the Middle East region. The marina will have the capacity to accommodate up to 400 boats. It will also comprise a boat maintenance center, a yacht club, a number of waterfront townhouses as well as numerous facilities and outlets. 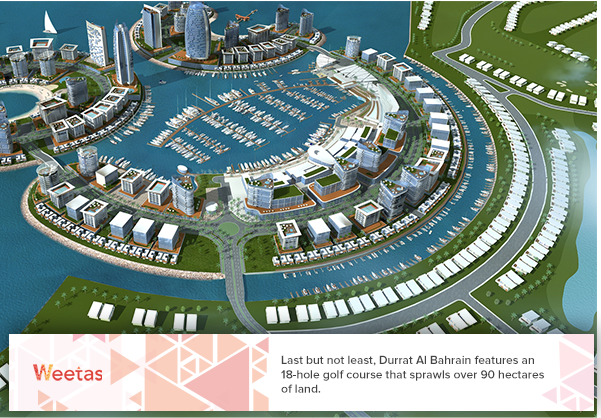 Last but not least, Durrat Al Bahrain features an 18-hole golf course that sprawls over 90 hectares of land. The course is located in front of Durrat Marina, and it houses a golf club, a 200-key 5-star hotel as well as more than 2,000 luxurious villas and residential apartments. 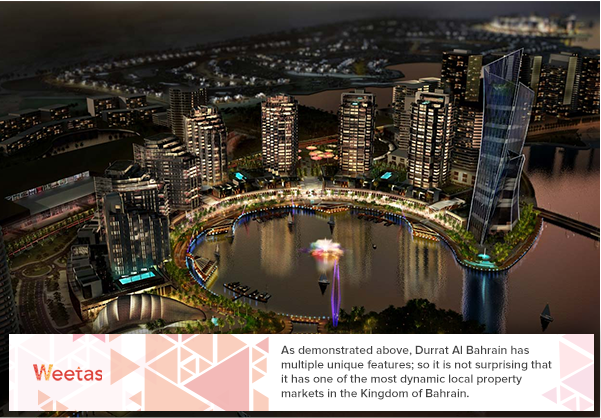 As demonstrated above, Durrat Al Bahrain has multiple unique features; so it is not surprising that it has one of the most dynamic local property markets in the Kingdom of Bahrain. For example, if you want to invest in an upscale one-bedroom flat in Durrat Al Bahrain, you can find one for the average price of 55,000BHD. However, if you are looking for a larger space that would fit as a new home for you and your small family, then a two-bedroom apartment with a stunning waterview for 72,000BHD would be perfect for you. Lastly, if you’re looking for the even more spacious and luxurious options, you can purchase a three-bedroom apartment in Marina Breeze project for 102,500BHD. It is safe to say that Durrat Al Bahrain will be one of the top lively hubs in the GCC. With its location, features, and amenities and services, Durrat Al Bahrain is indeed an investment that is worth your consideration.